You're supposed to be getting a post with a recipe and fabulous pictures of the wonderful cake I made today. There will be no cake today. Not because the cake doesn't taste wonderful. Because it does. It is delicious. But damn if it isn't UGLY. It's just not picture worthy. So we will eat it...and I will make another one. A pretty one. For pictures. And today you get green beans. Really great green beans. I promise. 1. Preheat the oven to 500. Mix the yogurt, lemon juice and 1/2 teaspoon salt in a bowl; set aside. 2. Toss the green beans with the olive oil on a baking sheet; season with salt. Spread in a single layer, put into the oven and roast until nicely charred and cooked through, about 13 minutes. 3. Meanwhile, heat a large skillet over medium-high heat. Add the pancetta and cook until crisp, about 2 minutes per side. Add the caraway seeds and onion and cook, stirring, until the onion is translucent, about 5 minutes. Remove from the heat and stir in the parsley and almonds. 4. 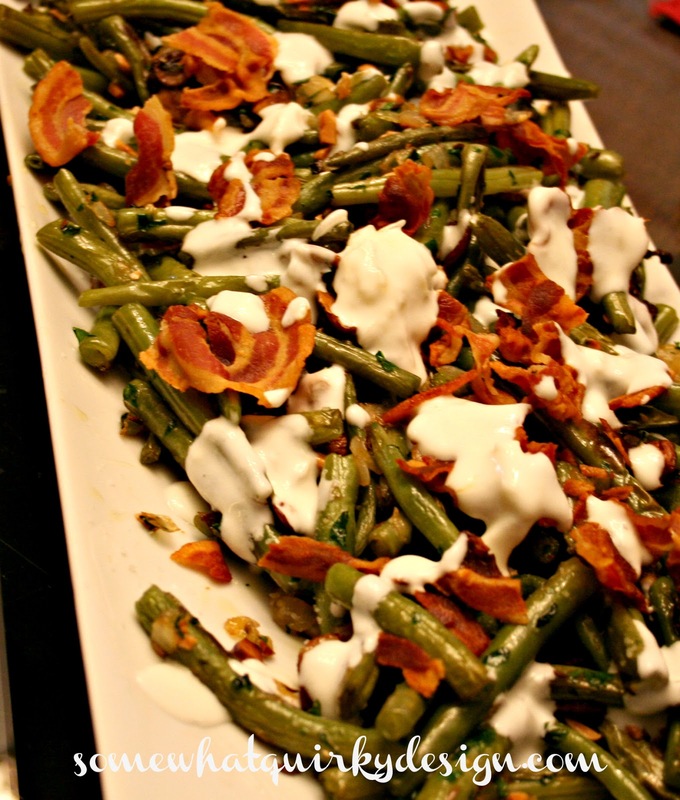 Toss the green beans with the pancetta mixture and transfer to a platter. Spoon the yogurt mixture on top. * This recipe was in the November 2012 edition of Food Network Magazine. 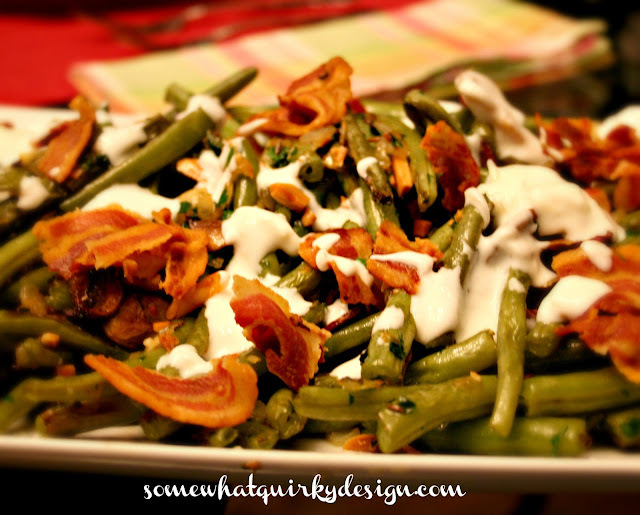 These green beans are amazingly good. Not as good as cake. But really good for a non-cake item. I could eat them every day. They are delicious hot. They are delicious cold. I promise. Oh yeah, I forgot to mention that I added mushrooms when I made this batch for the pictures. I roasted them in the oven until the "wetness" was gone. You don't need to add mushrooms to make these beans taste wonderful. I just wanted to try it. Sometimes you blogger chicks just crack me up!!! Wow, Karen, looks like something out Bon Apetit. Beautiful photography and it sounds yummy. I come for cake and I'm served green beans. Thank you for watching out for my diet. Darn you anyhow. I think I'm glad you didn't picture cake. I started a diet on Monday and I think looking at a gorgeous cake would have put me over the edge. 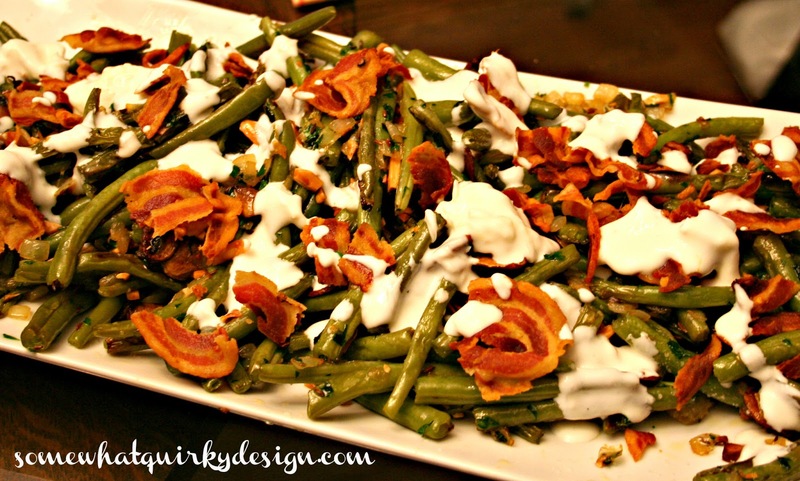 The green beans do look delicious!! Karen, those beans look delicious...and who cares if the cake was ugly...the only thing that counts is it tasted good! Let them eat.....green beans? It may not work for Marie but it works for me! These look fabulous! We are eating LOTS of veggies here and I'm always looking for a good recipe. Great pics! It is just as well there is no cake, I started a diet yesterday and cake is not on it. But green beans can be! Looks delish - I pinned it. Usually I would rather see an ugly cake over green beans any day, but I have to tell you.....Those green beans look fabulous!! I have many Bad Cake Days myself. lol I never know what to do with green beans, so your recipe is especially welcome. Delicious!